Today I am going to tell you about the best compliance culture idea I have ever heard: Pet Posters. 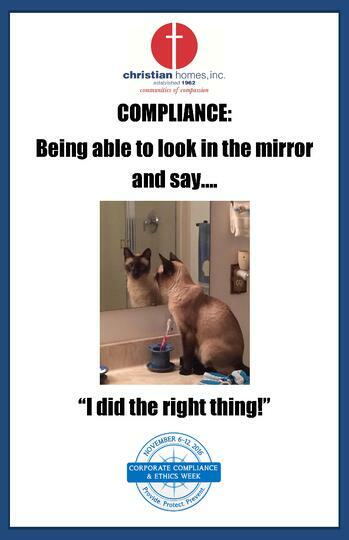 That's right: Using employee pet photos to create posters promoting compliance. This idea is clever, charming, motivating, effective - and the brainchild of Connie Rhoads, Vice President of Corporate Compliance at Christian Horizons, a senior living provider in the Midwest. I interviewed Connie to learn more about how she came up with Pet Posters and how it has been a success at Christian Horizons. (Side note: Connie and I agree that the Ghostbusters poster is our favorite - but it's hard to pick just one). Margaret: How did you come up with Pet Posters? I attended a webinar that shared examples from companies who achieved significant impact from small changes to their compliance programs. 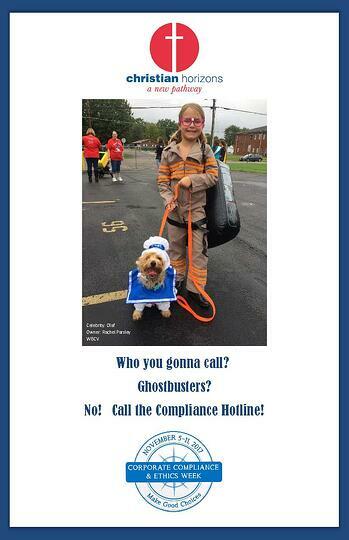 One of the companies shared their updated compliance hotline poster. They had simply changed the picture on their poster from a rotary phone to a picture of a puppy with its head tilted, as if it was unsure of something. Simply changing the picture was enough to capture their associates' attention. The Compliance Department started receiving appropriate concerns when previously a hotline call was a rarity. That was my inspiration! I thought to myself, everyone loves pets, especially their own, so I came up with the ‘Is Your Pet Destined for Stardom?’ Compliance Poster Contest. Our marketing team created a flyer for the contest and poster templates. I also created a page of suggested slogans. Associates simply had to insert their pet photo into the template, add the slogan, save it and send it in. We included credits to the ‘Celebrity’ and their owner on each poster. Margaret: How long have you been using the Pet Poster program? Our inaugural promotion was for Compliance and Ethics Week 2016; 2018 is our third year. Margaret: Have you had any participation obstacles – and how have you overcome them? Yes - a few. I was so excited when we first rolled out the contest, because it was generating so much buzz for compliance! We had planned to allow associates a month to submit entries, but during the first two weeks, we barely received a handful of entries. I was very discouraged until a nurse aide called me: She had several pets and wanted to submit entries but didn’t have a way to email them to me. She asked if she could text me the photos. I couldn’t believe I hadn’t considered that; I reissued the contest flyer but this time, I included my cell. The associates blew up my phone with entries and Year 1 was a huge success as a result. The following year, some Christian Horizons communities set up computers in employee break rooms, and management volunteers helped associates create their posters. In Year 2 we had over 120 entries but now in Year 3, the entries are down. Like so many things in compliance, it might be time to change things up to grab associates' attention again. Maybe babies and grand-babies in 2019? Margaret: How do you think Pet Posters have changed your culture of compliance? The Pet Posters have generated a lot of buzz for the compliance program, which helped promote compliance initiatives and strengthen our culture of compliance. It makes me laugh to think back on some of those Year 1 initial entries. Many posters included pretty harsh and rather threatening slogans, such as ‘DO THE RIGHT THING, or Compliance will get you!’; ‘Comply or Get Fired! ; and ‘Watch out! Compliance sees everything!’. My initial reaction was: YIKES! Is that what they really think of Compliance, or of me? I was a department of one, so apparently something was getting lost in translation if this was their perception. I called the pet owners to find out how they arrived at their slogan; determine whether they were sold on it; or, if they wanted to brainstorm for something funnier or more impactful? That led to engaging one on one conversations about how compliance impacts their role and responsibilities within Christian Horizons' Mission. It also provided assurance that the Compliance Department is here to serve as a resource and to help mitigate risk for the organization as a whole. As the Year 2 posters came in, their slogans were kinder and funnier, and helped promote compliance awareness. For Year 3, we updated the slogan suggestion page to include department specific slogans for housekeeping, culinary and environmental services, nursing, business office management, etc… We encouraged associates to include slogans and pictures about how compliance impacts their role or their department. We hope the Year 3 posters emphasize each associate’s personal responsibility to actively contribute to our culture of compliance. Also, the compliance department started receiving more inquiry calls; direct reports of compliance concerns; and, the hotline activities were up and no longer predominantly HR related. The communities even started inviting me to come speak to specific departments that were struggling. We can track the increase in contacts to Pet Posters Year 1, and it has continued to build. This has been an inexpensive promotion, but it has done more to raise compliance awareness than any other training or activity we have implemented since our program started. Beyond a Compliance and Ethics Week, we also get yearlong ‘advertising’ for compliance out of this promotion. First, we provide the community with two copies of each poster submitted: One for display during Compliance and Ethics Week and one for the pet owner to keep. Most associates find a way to display their celebrity’s poster in their work space and keep it up year after year. Second, we print a set of all the posters and display them for the November Board meeting. The 13 posters that generate the most buzz from the Board members are included in a Corporate Compliance Calendar. We print the calendars ourselves and distribute several to each community for display in their staff areas throughout the following year. Margaret: What advice do you have for compliance officers just getting started with compliance culture efforts? It doesn’t take deep pockets to develop a strong culture of compliance - a culture of compliance is not something a company can buy. Develop a network of compliance professionals you can collaborate with (Note from Margaret: That's how I met Connie and learned about her fantastic Pet Posters!) The compliance professionals I have met are some of the most knowledgeable, creative, strategic and generous people I have encountered. It still astounds me how willing these seasoned professionals were to share their knowledge and ideas with me when I was a relative newbie. Our programs will always be a work in progress but the work we do is purposeful, important and rewarding. I can’t imagine doing anything else. Thank you, Connie! If you start a baby/grand-baby poster campaign in 2019, I'd love to see the posters. If you have a compliance idea you'd like to share, let me know.